She serves tea in china cups. At the age of 100 Ethel had a fall, broke a hip, and despite the odds, returned to live,alone, in her little house in Margaret, in southwest Manitoba. Until the age of 103 she served cheese whiz on margarine covered toast and tea in china tea cups to visitors. On my visit to Ethel, a week after her 105th Birthday, she greets me, “You can’t image how wonderful it is to see you!” She is alert and during the visit asks, ”How is your mother?” “How are your brother’s crops doing?” “What do you think of the situation in Syria?” and, “How are you? 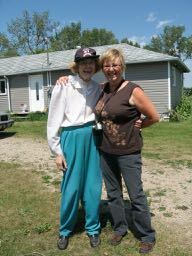 People ask about you all the time.” After her second fall she moved to a personal care home in Boissevain. A visit with girls from the city – Claudia and Jamey enjoy cookies and a soft drink. Neighbor Gwen Johnson in front of Ethel’s house. 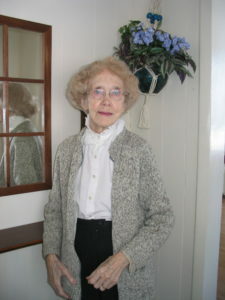 When she was born, Margaret had more than 100 people – blacksmith shop, community hall and rink, Friday night dances, boarding house, school, general store. 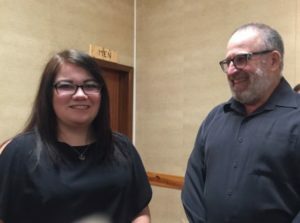 Living through the demise of a small community filled with sports, dancing, singing in the church choir and to a current population of 10, she was never bored. After a courtship of 20 years, she married Spike Tibbatts, who is now honored for his pitching in the Manitoba Baseball Hall of Fame. They tended the town as if pubic spaces were their personal responsibility. Beautiful flowers and well maintained lots, leave me memories of a place that won Best Kept Town Award. Whether this really happened or not (I believe it did) the story of her baking a cake for a farm family, rolling her car into the ditch on her way there, and getting out of the car with cake, walking the rest of the way for delivery, is symbolic of her ability to face life circumstance with energy and kindness. 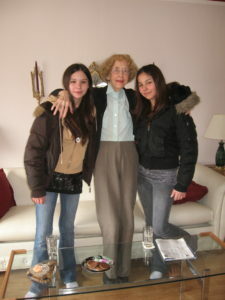 Still friends, the younger Aunt Glady is only 92. 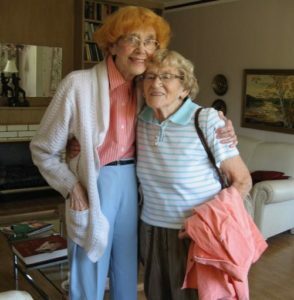 Visiting Ethel, I learned respect for the wisdom and satisfaction in living a simple, unadorned life. “When technology is the master, it leads to disaster faster,” she joked. Once I asked her where she got her bread for the toast she was serving me, “Oh probably from the Dumpster,” she said, “Phil (a neighbor known for unusual habits) brought it to me.” Yes, she had good genes, and when younger had eaten food from her own garden, but her attitude was invincible and kept her young in the heart. Kadence Morrow and Ken Fleming pay respects. 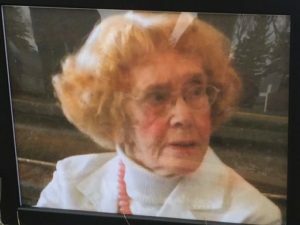 Ethel passed last month, before I finished writing this tribute to her. The community of my childhood friends, family and community filled the Minto church (Margaret’s no longer existed) to pay tribute. 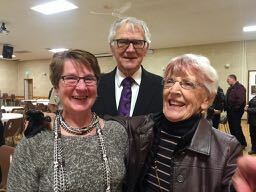 Younger brother, Ross between his wife Martha (right) and former neighbor Sharon Patterson (Kinsley).